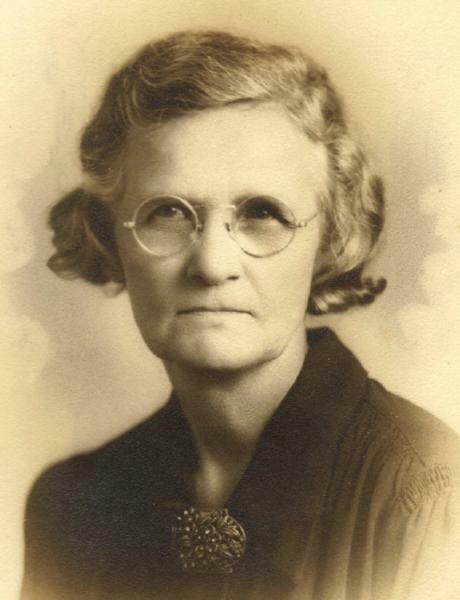 Claudia Gertrude Bay was born on 30 January 1885 in Fairview, Grimes County, Texas. John Edwin Bay and Stacy Scott Teague appeared in the US federal census of 1 June 1900 in Grimes County, Texas. Other members of the household included Claudia Gertrude Bay, James Foster Bay, Willie Agnes Bay, Mary Lee Bay, Olive Elizabeth Bay, Francis Oscar Bay and Eugenie Salome Bay. She and Rush Brevard Wood obtained a marriage license on 22 December 1900 in Grimes County, Texas. She married Rush Brevard Wood, son of Solomon William Wood and Martha Clarana Reed, on 23 December 1900 in Dolph (later Fairview), Grimes County, Texas. Gertrude was Rush and Claudia's youngest child. Claudia Gertrude Bay became a widow at the 25 April 1939 death of her husband Rush Brevard Wood. Claudia Gertrude Bay appeared in the US federal census of 1 April 1940 in Grimes County, Texas. The following appeared on 27 April 1940 in The Eagle: . . . Also an invitation from Gertrude Wood of Richards to attend her graduation from Richards high school on Thursday, May 23, at 8 o'clock at the high school auditorium. Gertrude is the daughter of some of the best friends we have ever had, Mr. and Mrs. Rush Wood. Rush died a few years ago but Mrs. Wood is still carrying on. . . . The following appeared on 27 December 1942 in the Harlingen Valley Morning Star: (Edcouch) Mrs. Rush Wood, who has spent several weeks in Edcouch assisting in the care of her sister, Mrs. J. M. Cellum, left Monday night for her home at Richards in response to a message stating that her daughter was quite ill.
Claudia Gertrude Bay died on 7 June 1963 at age 78 in Rosenberg, Fort Bend County, Texas. A single grave marker identifies the graves of Rush Brevard Wood and Claudia Gertrude Bay.